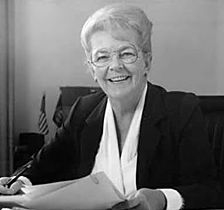 ... 1982, the President of the New Hampshire Senate, Vesta M. Roy became the 1st Republican woman governor of a U.S. state. She was sworn in on this day when the outgoing incumbent died shortly before the man elected in November to replace him was to be inaugurated. Governor Roy (right) served 7 days, until that inauguration. She continued as a state Senator till 1986, and also served as a state-level campaign advisor to 3 U.S. Presidents. (photo credit) Roy died in New York in 2002, at age 76.